Singapore, an Island country off the Southern tip of the Malay Peninsula in South East Asia has a total land area of 274.2 square miles and a population of around 5 million. Though its virgin rain-forests are almost a thing of the past, about 23% of its land area is covered with forests and nature reserves. 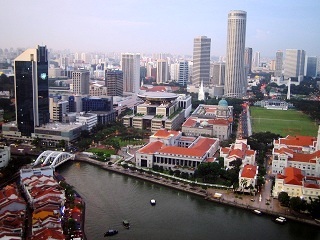 Singapore is highly urbanized with a market-based economy. It has the best quality of life among Asian countries. The economy is represented by electronics, petroleum refining, chemical, tourism, and biomedical sectors. It is a leading financial center, a primary logistics hub, and one of the largest foreign exchange trading center. The government lends a helping hand to the poor by providing them with cheap housing and financial assistance. Singapore can be visited any time of the year as it has a tropical rain-forest climate with predictable weather conditions. To promote tourism further, gambling was legalized. Medical tourism is also a big draw-card for Singapore. Among the major attractions are Bukit Timah Nature Reserve, Singapore Flyer, Marina Bay Sands Skypark, China Town, Little India, and Raffles Hotel. Shopping and dining are a pleasure activity in Singapore. Ethnic foods of different cultures are in plenty. Lonely Planet Singapore City Guide 978-1741046649 $15 Good introductory information covering about 40 pages followed by sections on Neighborhoods, Shopping, Eating, Drinking and Nightlife, Arts and Leisure, Sleeping, and Excursions. The first stamps of Singapore were a long set of twenty stamps released in 1948 depicting a portrait of King George VI (KGVI) and the key type inscriptions Malaya and Singapore. The set (Scott #1 to #20) catalogs for around $275 MNH and around $30 used. A variety of the same design in different colors and denominations were released during the period from 1949 to 1952. That set (Scott #1a to #20a) is even more valuable cataloging for around $500 mint and around $50 for used. Common Design types in the silver wedding, UPU, and coronation themes formed the primary stamp issues of Singapore during the period till 1955. The common design types are generally not that valuable although one exception is the $5 denomination (Scott #22) that catalogs for around $130 mint and around $45 used. Singapore was part of the Straits Settlements and used their stamps until the early 1940s. During World War II, it was occupied by the Japanese and became a British Crown Colony from 1946. Singapore released a set of fifteen stamps on September 4, 1955 showing local scenes and Queen Elizabeth II (QEII). The set (Scott #28 to #42) catalogs for around $140 mint and around $13 used. The designs show Chinese Sampans, Malay Kolek, Twa-kow, Lombok Sloop, Trengganu Pinas, Palari, Timber Tongkong, Hylam Trader, Cocos-Keeling Schooner, Argonaut Plane, Oil Tanker, Liner, Sir Stamford Raffles Statue, Singapore River, and Arms of Singapore. Singapore gained self government on June 3, 1959. The state of Singapore merged with the Federation of Malaya to form the Federation of Malaysia. On August 9, 1965, it became an independent republic. A set of five stamps released in 1969 in the Musical Instruments theme. The set (Scott #107 to #111) catalogs for around $60 MNH and around one-third that for used. The designs show South Indian drum called mrudangham, Chinese papa, strings, Malay violin termed rebab, Indian veena, and Chinese drum termed ta ku. A set of thirteen stamps released in 1973 showing stylized fruits and flowers. The set (Scott #189 to #201) catalogs for around $50 MNH and around $20 used. The designs show agave, coleus blumei, Madagascar periwinkle, sunflower, dwarf palm, yellow daisy, chrysanthemum, costus, transvaal daisy, mangosteen, jackfruit, coconuts, and pineapple. A set of four stamps released on September 27, 1983 showing a world map and the ASEAN Submarine Cable Network. The set (Scott #426 to #429) catalogs for around $5 MNH or used. A few other sets were issued over the years in the Cable Route theme. The sets form a good collectible theme. They have the distinct feature that the main circular inside design has perforations in addition to the square perforation. The stamps with the corner collars removed have very limited value. A set of four stamps released on October 10, 1990 in the Tourism theme. The set (Scott #580 to #583) catalogs for around $25 MNH or used. The designs show Chinese opera singer and Siong Lim Temple, Malay dancer and Sultan Mosque, Indian dancer and Sri Mariamman Temple, and ballet dancer and Victoria Memorial Hall. A set of four stamps released on June 27, 2002 showing Tropical Birds. The set (Scott #1014 to #1017) catalogs for around $5 MNH or used. The designs show red-throated sunbird, Asian fairy bluebird, black-naped oriole, and white-bellied woodpecker. The first coins of Singapore were Republic Standard Coinage (100 Cents = 1 Dollar) Bronze Cents issued in 1967. The first issues had high mintage and catalog for well under a dollar. The first gold coins were 0.1 troy ounce Dollars issued in 1983. The design shows Arms with Supporters in Obverse and Carp and Lotus Flower in Reverse. Coins $1 and up UNCs from the 1980s onward starts around $1. Mint Year Sets from the 1980s starts around $15. Early Year Sets, Low Mintage Proofs with COA, Silver Proofs, etc starts around $50. Low Mintage Silver Proofs and Sets, Gold Proofs, etc go well into the 100s. Paper Money $3 and up Recent Polymer UNCs starts around $3. High Value UNCs, Early Large Notes, etc starts around $15. Low Numbers, Rare Dates, Consecutive Serial Number UNCs with 5-pieces or more, etc start around $50. First Serial Number UNCs, Bundles, Rare Replacements, Specimens, and Uncut Samples go well into the 100s and 1000s depending on rarity. Typical souvenirs are Selangor pewter, jade carvings, bronze statues, snuff bottles, Peranakan tiffin tins and coasters. Craft $10 and up Embroidered patches start around $10. Artificial Silk Plants start around $50. Art $10 and up Large panoramic Singapore landscape photos start around $10. Original oil paintings start around $50. Original works by Seah Kim Joo, Andre Goh etc go well into the 100s. Antiques $15 and up 19th century maps start around $15. Antique Perankan Tiles, Pewters, etc start around $30. Miscellaneous Collectibles $10 and up Singapore Airlines curios start around $10 and go into the 100s for large wood airplane models. Gold and Silver necklaces start around $50.